The Novena laptop’s Linux build doesn’t support the Samsung 840 EVO hard drive that it ships with. While this isn’t a problem specific to the Novena by any means, it will affect the users. It’s a simple fix, just edit the hddtemp.db file and add the proper ID string and temp code to it. You can just echo-append it, or if you are fussy open it in an editor and put it neatly in the Samsung section! If you want to find how to add this to hddtemp.db yourself, or on a different model drive that’s not in the db file, use smartctl and hddtemp --debug. The -A flag on smartctl lists the drive’s attributes. Look for the ID# for the temperature sensor. It also may indicate Celsius or Fahrenheit, but more likely it will be Celcius. Here we can see it’s attribute number 190, and based on the name, it’s in Celsius. the hddtemp man page before sending a report (section REPORT). Thanks. 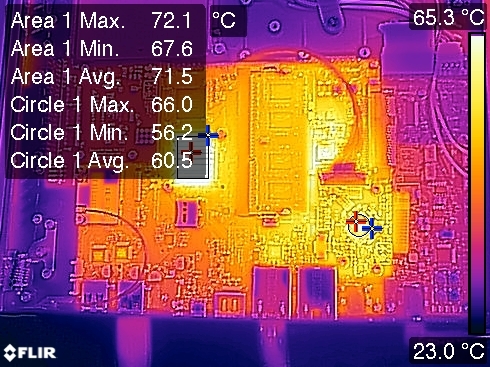 The CPU heatsink temp was calculated using an emissivity of ε0.83 for red anodized aluminum, and I used ε0.95 for the display board chip’s black plastic. 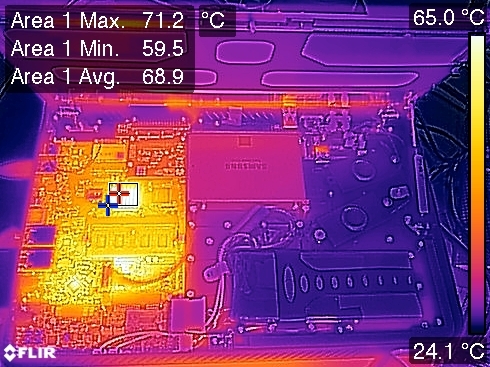 Remember kids, thermal emissivity is important to keep in mind! The i.MX6 datasheet lists the operating temperature range as 90C typical, with 105C maximum. Even still, it seems to run a bit hot at idle in my opinion, and I need to test it under extended load. Also will test with the lid closed (not sure it was designed to be operated that way) and in different orientations. I’ve also found a possible power supply issue when running on battery under high CPU load, but I still need to investigate. Update 3 May 2015: I’ve been compiling KiCad for over an hour, and it’s sitting at near 100% CPU use on all four cores, and running at max clock speed. 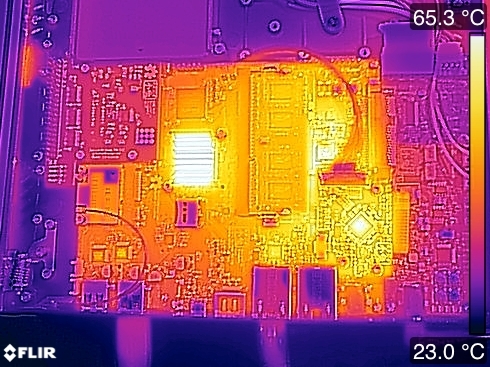 Figured I should take another thermal pic while it’s hot. 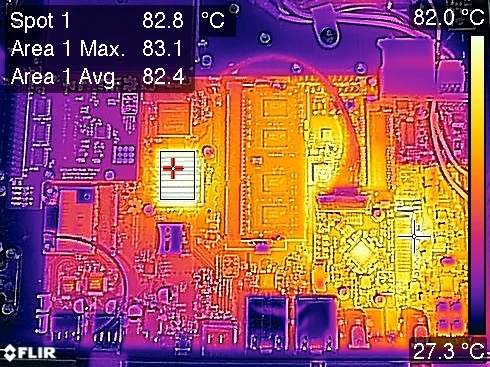 Not terribly bad for the hotspots, within the datasheet tolerances. Hotter than I’d prefer, and I don’t think I’d run it this hard for long with the lid closed, but no troubles.